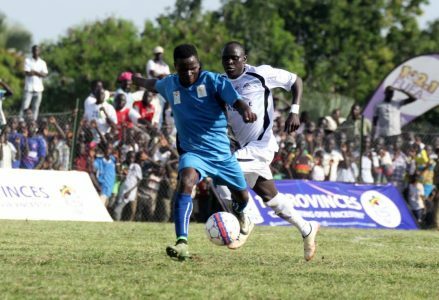 ARUA – Buganda have gone down in the history books as the very first winners of he FUFA Drum. This was confirmed on Saturday evening after they drew 1-1with West Nile to win the two legged final 2-1 on aggregate. Having won the first leg last week 1-0, Buganda knew that any sort of draw would see them crowned the victors and managed to achieve the fate although West Nile throw everything they had at them. West Nile who were backed with support from thousands of fans started the better side but the visitors stood firm in the early exchanges. The home side took the lead after several attempts through BUL FC forward Villa Oromchan four minutes to the break. Oromchan jumped high to head home a well delivered cross from left back Rashid Okocha to make it 1-0. The White Rhinos were however affected with injury blows in the second half, first with Geriga Atendere limping off and then Rashid Toha too walked off after sustaining an ankle injury. On 79 minutes , Viane Ssekajugo who has had a sublime performance in the tournament levelled matters, striking low to beat West Nile keeper Nafian Alionzi after he was teed up by his Captain Dan Bilkwalira. The scores now read 1-1 on the day with Buganda leading 2-1 on aggregate. Despite late pressure from the home side, Buganda held on to win the trophy that came with a cash prize of 32 million shillings while West Nile got 15 million shillings. Nafian Alionzi, Geriga Atendele, Richard Ayiko, Rashid Toha, Filbert Obenchan, Ronald Orombi,Abel Michael Eturude, Villa Oromchan, Abdul Malik Tabu,Ezra Bida. Nicholas Ssebwato,Ronald Kigongo,Dan Bilikwalira, Enoch Walusimbi, Savio Kabugo,Abdallah Nyanzi, Viane Ssekajugo,Allan Kayiwa,Saidi Kyeyune, Brian Majwega.